GENEVA, March 2, 2017 – A World Meteorological Organization committee of experts has announced new records for the highest temperatures recorded in the Antarctic Region as part of continuing efforts to expand a database of extreme weather and climate conditions throughout the world. The highest temperature for the “Antarctica Region” (defined by the WMO and United Nations as all land and ice south of 60°S) of 19.8 degrees Celsius (67.6 degrees Fahrenheit) was observed on 30 January 1982 at Signy Research Station, Borge Bay on Signy Island. The highest temperature for the “Antarctic continent” defined as the main continental landmass and adjoining islands is the temperature extreme of 17.5°C (63.5°F) recorded on 24 March 2015 at the Argentine Research Base Esperanza located near the northern tip of the Antarctic Peninsula. Thirdly, the highest temperature for the Antarctic Plateau [at or above 2500 meters (8202 feet)] was the observation of -7.0°C (19.4°F) made on 28 December 1989 at an Automatic Weather Station (AWS) site D-80 located inland of the Adélie Coast. The lowest temperature yet recorded by ground measurements for the Antarctic Region, and for the whole world, was −89.2°C (-128.6°F) at Vostok station on 21 July 1983. It is possible, indeed likely, that greater extremes can and have occurred in the Antarctic Region. As with all WMO evaluations, the extremes are identified based on only those events with available high-quality ground-based data. WMO’s Commission for Climatology maintains an Archive of Weather and Climate Extremes. This includes the world’s highest and lowest temperatures, rainfall, heaviest hailstone, longest dry period, maximum gust of wind, longest lightning flash and highest significant wave height. Spanning 14 million km2 (roughly twice the size of Australia), the Antarctic is cold, windy and dry. The average annual temperature ranges from about −10°C on the Antarctic coast to −60°C at the highest parts of the interior. Its immense ice sheet is up to 4.8km thick and contains 90% of the world’s fresh water, enough to raise sea level by around 60 metres were it all to melt. The Antarctic Peninsula (the northwest tip near to South America) is among the fastest warming regions of the planet, almost 3°C over the last 50 years. Some 87% of glaciers along the west coast of the Antarctic Peninsula have retreated in the last 50 years with most of these showing an accelerated retreat in the last 12 years. The verification of these three Antarctic extremes helps increase understanding about the Antarctic’s distinct climatic regimes, specifically maritime versus plateau environments. The WMO’s Commission for Climatology international evaluation committee noted that the records at all three stations occurred during an influx of warm air. At Signy and Esperanza, there was a warming “föhn” wind. At D-80, solar heating under clear skies at high elevation was a major contributory factor. The WMO investigations also serve to improve the quality of observations through the careful analysis of observation practices and proper equipment selection. “The Antarctic and the Arctic are poorly covered in terms of weather observations and forecasts, even though both play an important role in driving climate and ocean patterns and in sea level rise. Verification of maximum and minimum temperatures help us to build up a picture of the weather and climate in one of Earth’s final frontiers”, said Michael Sparrow, a polar expert with the WMO co-sponsored World Climate Research Programme. In an effort to increase weather forecasting and environmental prediction capability in the Antarctic and Arctic, WMO is one of the organizers of the Year of Polar Prediction from mid‑2017 to mid-2019. This is a concerted effort to increase and improve research, observing and modelling capabilities in the poles. “This investigation highlights the need to continually monitor all of the Antarctic Region and ensure that we have the best possible data for climate change analysis at both the regional and global scales,” said Randall Cerveny, WMO Rapporteur on Climate and Weather Extremes. Full details of the assessment can be found in an article published on 1 March 2017 in Eos.org, the American Geophysical Union’s Earth and space science news website. The WMO’s Commission for Climatology (CCl) international evaluation committee consisted of polar science and climate experts from Argentina, Spain, Morocco, New Zealand, the United Kingdom and the United States. The international evaluation committee defined the primary temperature record in accordance with existing WMO and UN definitions of the Antarctic Region (comprising all ice and land south at or south of 60°S). Additionally, it verified a popularly accepted definition of the Antarctic Region as the continental landmass. 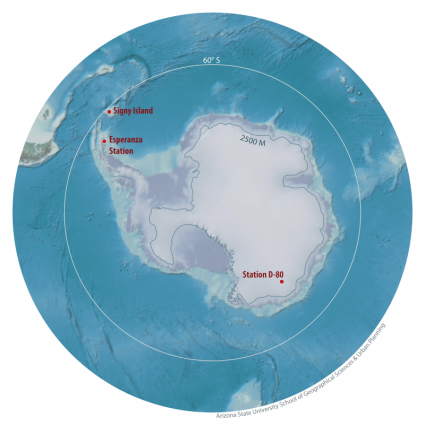 A third record, for the Antarctic Plateau (at or above 2500 meters) was defined to address more fully the wide range of environmental conditions existing in the Antarctic Region. As with all WMO evaluations of extremes (e.g., temperature, pressure, wind, etc. ), these extremes are identified based on only those events with available quality data and brought to the WMO’s attention by the geoscience community. It is possible, indeed likely, that greater extremes can and have occurred in the Antarctic Region. However, the extremes presented here are the highest observed temperatures placed before the WMO for adjudication. When higher extreme events are effectively recorded and brought to the attention of the WMO, subsequent evaluations of those extremes can occur.